« Review of "Amazon Web Services: Migrating your .NET Enterprise Application"
This entry was posted on Sunday, December 4th, 2011 at 5:51 pm	and is filed under Personal, Technical. You can follow any responses to this entry through the RSS 2.0 feed. You can leave a response, or trackback from your own site. I bought an Android tablet in Shenzhen for ~£28. A better purchase than your £89? Depends where you are on the scale of "it's better to have nothing, than something bad". Kind of glad I didn't end up getting one during the firesales. I still have a hard time of even justifying buying an iPad - I've tried it at the stores and at friends' houses, and I just can't bring myself to see when it'd be useful, so I'm guessing this TouchPad would have been an overpriced paperweight. There's generally always a laptop within arms reach in this house, so the iPad is mostly used for bedroom and breakfast reading. I used to be in the habit of checking e-mail, Hacker News etc before getting out of bed, but that wasn't really a good idea! As with most things in this space the software is connected to the human being so much more than it used to be. Keyboards and mice add an area of delay that is considered acceptable (perhaps also because of our previous decades worth of experience) but when you are cuddling this little pad of glowing goodness our ability to interact with it needs to be exact and instant. I have had the touchpad for about 3 months now. I also have 2 Ipad 2's. Funnily enough I use the touchpad routinely for work with apps like splashtop and its ability to bring all my mail (and contacts) is fabulous. Its really easy to use and carry around to meetings, looking at materials etc in meetings. I don't want to bring my games / leisure reading Ipad2 to work even though its lighter. I have installed Android on the touchpad and occaisionally switch to Android but the mail client isn't as good, nor is it as intuitive to use in my opinion - although its a good android implementation - I kind of use it like my 'leisure partition' on the touchpad plus access to network files and a have decent explorer give it some additional legs and flexibility over Webos and Ipad. I use Android on the touchpad for netflix when I have to because there's no netflix lclient for touchpad. Had some serious early problems with wifi connectivity in android which kept me in webOS till alpha3 - now resolved - but I still prefer the mail client in Webos. The newer apps on Android are also catching up greatly with Ios in terms of breadth of covereage and quality. Eventually (after ICS) I will likley migrate it fully to Android and stay theere. I have 3 young kids and they really enjoy the mix of educational and games available. I like some of the educational stuff coming on Android bettter rthan Ios now but if I searched more I could probably find equivalents on both sides. The big bummer is having to pay for the same software on different platforms for non free software. Interesting opinion there Raif. There are obviously some very good uses for the TouchPad I haven't had cause to need to try out! What about going the other way, buying an android tablet (more powerful spec) and putting webos, it doesnt really fix issues of cost and what ever HP position on webos is now, hopefully the community could pick it up, reimplement parts of it (similar to beos -> haiku, but that's a complete rewrite). 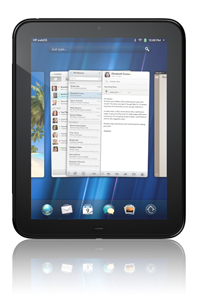 WebOS seems to be the tablet OS I want, but its kinda hard to justify, the dual boot idea may make it happen thou. TouchPad is another example of big company no one responsible of anything even a better optimised version of sw, how can it be slower the first version iPad. Joke on webOS/HP. btw, the guy running Palm before they got bought by HP was Steve Jobs left hand man who created the IPod. so it is NOT one person could make a good product but a spirit which could.